A few years ago, when I was living in Budapest, my roommate mentioned that you can make any food sound fancy by just listing all the ingredients in it. For instance, “a tomato-Vidalia-jalapeno-cilantro medley with a hint of lime” sounds way fancy pants compared to “salsa from this jar.” Similar story with maple-walnut-oat scones. Incidentally, the fact that I was in Budapest was completely irrelevant above. Also, the fact that I’m giving a talk tomorrow on the fundamental theorem of Bass-Serre theory (will be a series of posts sometime, it uses the graph theory and group theory we’ve been talking about) doesn’t seem that relevant, but it is key to the existence of this post. So! It was my turn to bring treats to seminar this week, and I whipped up these scones because I have a food processor now. 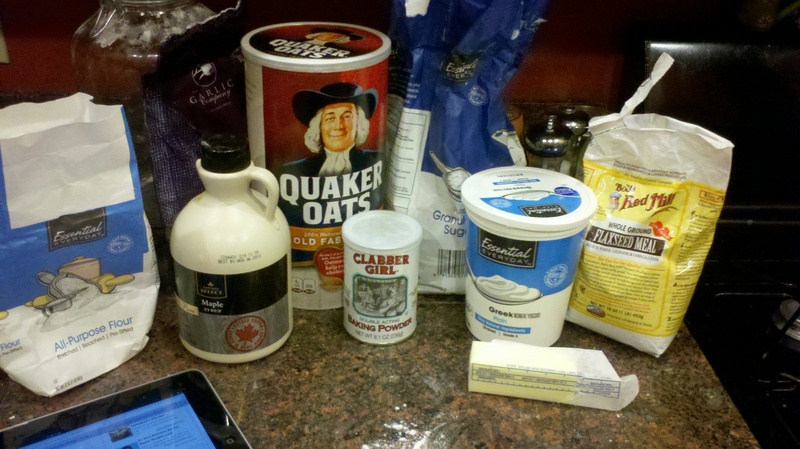 Also because I had all of these ingredients in my house. You may have noticed that I ran out of eggs a few weeks ago and never bothered to buy more. Same story today, so we’re still egg-free using the flaxseed trick. 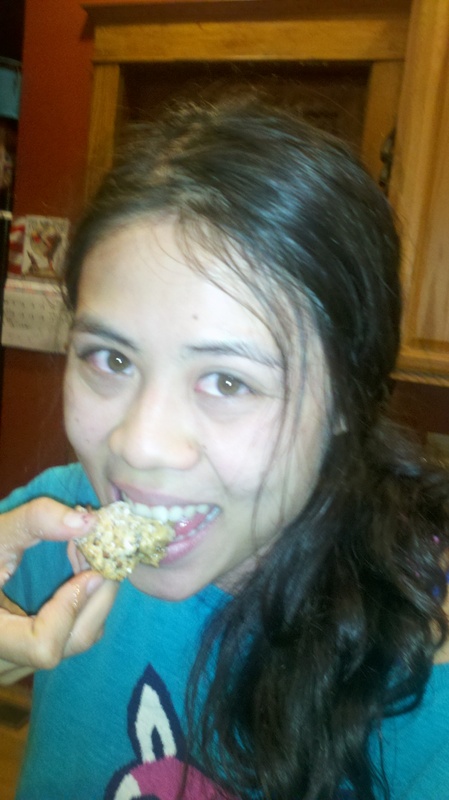 It does add a nice nutty ‘healthy’ taste to all my baked goods, without changing the texture too much. If JRR Tolkien was in my kitchen, I’d make him take all of these things. Then when we later put on a play of his works, I’d make him be the talking trees, and call him a GREEDY ENT. 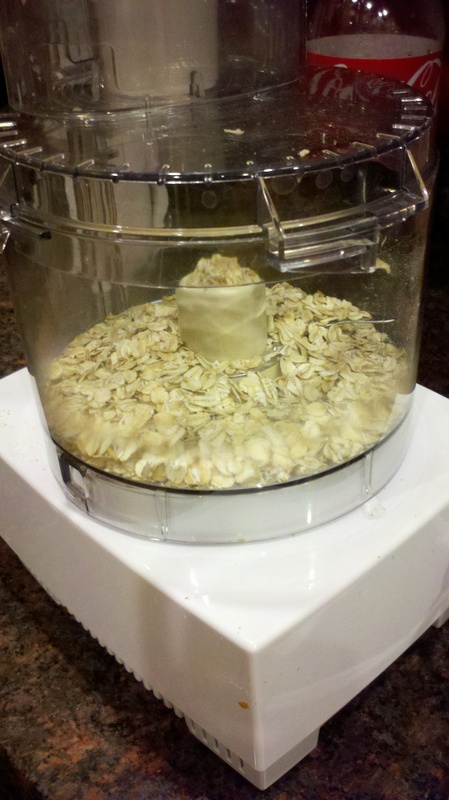 First, you can blend up your oats. I pulsed half of mine for 15 seconds, and left the rest whole so I’d have some nice chunkiness. If you want your scones to be more like those addictive ones from Starbucks, then you should pulse all of them. Chop chop! We want these poat haste! This is basically a one-bowl recipe, where the bowl is the food processor. You add your flour, baking powder, salt, little bit of sugar. Pulse to mix those in. 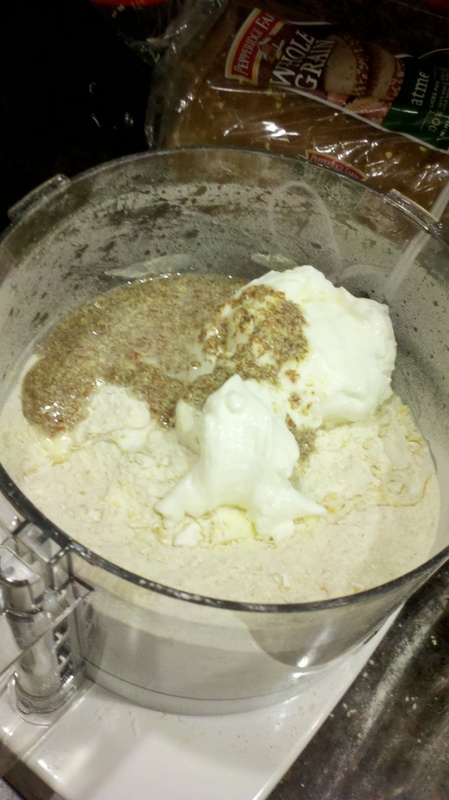 Next, plop in your flaxseed stuff that you’ve been letting sit from the beginning (or an egg…), some yogurt, some butter, and some maple syrup. Pulse. Once it’s a nice crumbly-wet-maybe will stick together consistency (it’ll be sticky), stir in your toasted walnuts (I just threw mine in the toaster oven for five minutes while making the flax thing) and throw it onto a silpat or parchment paper. 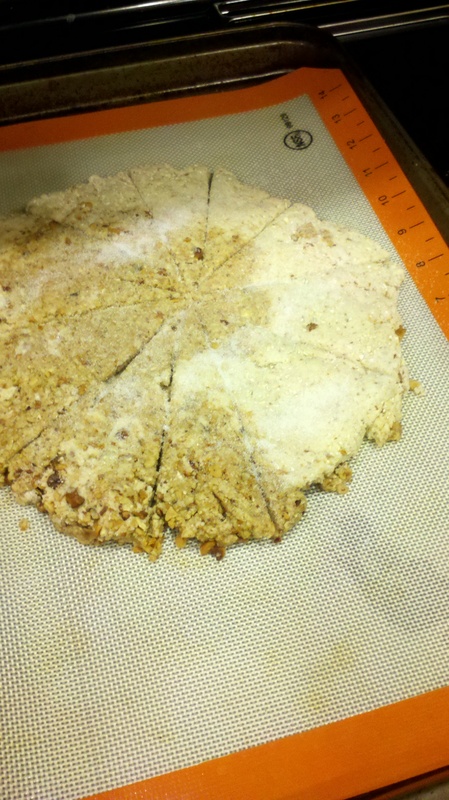 Pat it out to a big circle and score it with a sharp knife (that’s how you get those crispy edges!. Sprinkle with sugar. Geez you were freaking out earlier. Thought I’d have to take your pulse. Bake. After you’re done baking, you can make a glaze by mixing powdered sugar and maple syrup, and dribbling it on your hot scones. Delish! Sometimes I like singing (like in the shower, or on the street, or when I wake up). If I did so while baking, well, that’d just be icing on the cake. Pulse to mix, or use a whisk and a bowl if you aren’t lazy like me. 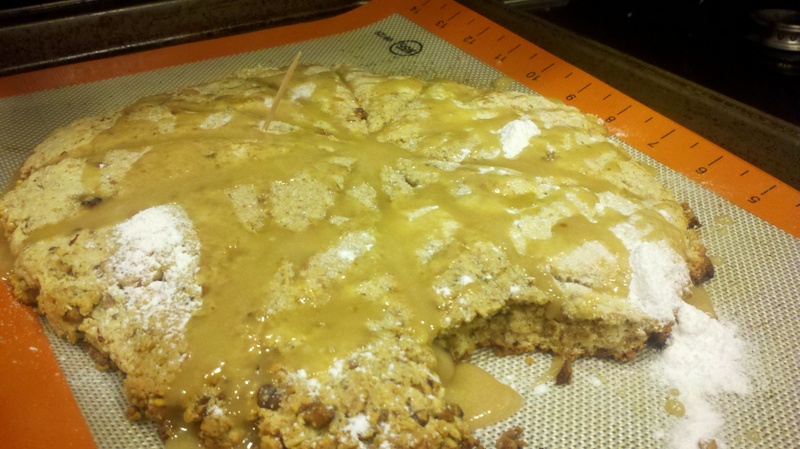 Process that for a solid 20 seconds or so, until it looks like a super crumbly dough. Pat out on your silpat into a big circle (1-2 inches tall), and score with a knife into 8-12 wedges. However big you like your scones. Top with an icing made by putting a big heap of confectioner’s sugar in a bowl, and pouring 2-4 TB of maple syrup on it, stirring until completely mixed. This part is super key, guys.